Europeans on the web have typically been much more privacy aware than their US counterparts. So the WhatsApp exodus post Facebook purchase (as seen in the iOS AppStore charts led by alternative clients in a number of European countries) didn’t surprise me that much. But what was unusual is my personal decision to join the masses and move to alternative messaging clients. Having spent the better part of the decade working in an IT security competence center (with a WhatsApp history) I try my best to distinguish between privacy paranoia and real issues. WhatsApp has had terrible privacy and security issues in the past but in my mind the sale poses a much larger concern than anything before. Since a lot of my knowledgeable and respected peers are downplaying the risks I will try to explain my point of view. Facebook paid 40 USD per user and WhatsApp charges roughly 1 USD per year per user. They have announced that they won’t be putting ads on WhatsApp and we can also safely assume no single user will spend 40 years on WhatsApp. So Facebook needs to generate more income per user to cover their costs. One option would be to up-sell additional services, like the recently announced voice features. But seeing as there are often free alternatives I don’t think this will be the major revenue stream for the average user*. The more obvious revenue stream is of course advertising. Not on WhatsApp itself, but on Facebook. Very few people have come in contact with their ad platform and probably don’t realize that Facebook has one the best ad targeting platforms available. 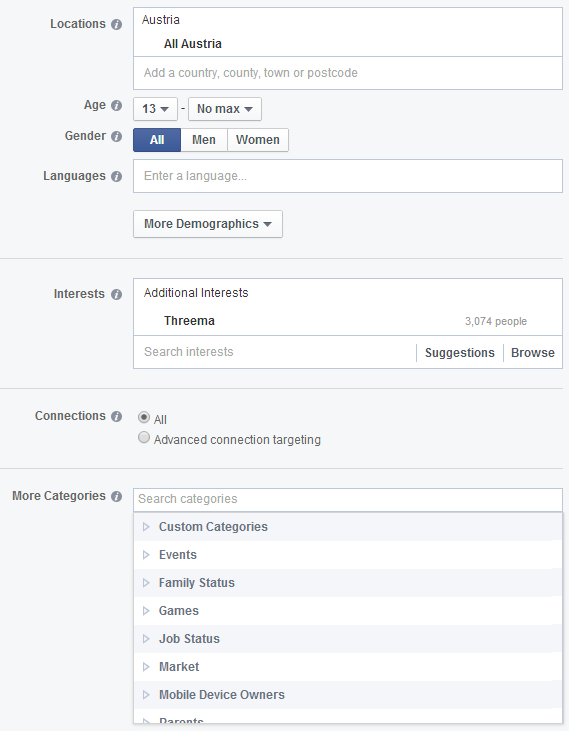 Take a look on the right at what features (or “signals”) you can choose to specify your audience: basic demographics, interest but you can also include or exclude people based on likes, connections etc. The signals available here are more or less opt-in meaning I chose to tell Facebook about them. If I specify an interest in Japanese sencha then I can expect to be shown ads that sell tea. Fair enough. Take into account that Facebook is data hungry enough to save messages you never even sent it is more than likely that your WhatsApp messaging data will somehow generate new signals for the Facebook ad platform that advertisers can use. And that’s where the problem lies. I never opted-in to the use of my messages on WhatsApp in the past for this purpose. Their firm stance on not using ads actually reduced the risk of them ever using conversations between friends and family for this purpose, but after the sale all bets are off (especially considering the maths). Think back to your conversations for a moment. Did you ever mention an injury to a friend in an apology for not going to their birthday party? You most certainly didn’t “like” that type of injury on Facebook or specified it as an interest – but what if Facebook decides that ads can be targeted to you for your injury in future by using the WhatsApp data? By now I imagine a lot of you asking: “Who cares? So I’ll be bombarded by medical ads in the future. I don’t care.” This is where things get ugly and most people don’t think around the corner. Marketers are clever people. Risk managers are often even cleverer. Let me outline the scenario: Your insurance company is constantly trying improve their risk assessment of you. Of course they would like to know of any hip injuries you have that may need treatment in the future because it increases their costs. But how do they get that information? Let’s say they create an enticing ad with a pretty girl smiling and the phrase “win XYZ”. There’s a good chance you will click on it. What you don’t realize is that the ad was only shown to people who talked about hip injuries using Facebook’s ad targeting. By clicking on the ad you were taken to a specific page on the insurers website and they can now change your personal risk assessment based on that click**. Suddenly your insurance rates go up and you may never even know why. As an internet user I am aware that a lot of what we consume is free thanks to advertising. I’m not inherently opposed to that and believe that good ads are personalized. Also I believe you have to make a conscious choice what you decide to share on the web. If you post, share or like anything on an ad supported platform, think of it as public information. So by making a conscious decision to change to a messaging tool that is not entangled with an ad network I can theoretically not be targeted in the aforementioned way. My choice is Threema – sure it has it’s issues – but as a European company I put some trust in EU privacy laws. And in the worst case… Well, my data is already out there. Game over. *: An exception to this could be a trend emerging in Asia where messaging services are moving towards up-selling a lot of services, apps, ads etc. **: Chances are you’ve already visited their website and logged-in, so there’s a cookie saying who you are, or you will do that in the future. ***: A practice known as re-targeting. Next Next post: How colorful is your tea? Good point. The Swiss have had an even stronger stance on privacy in the past (e.g. banking), but yes they won’t fall under EU privacy laws I guess. @randomelephant well not quite – when using fb products I am fully aware of the potential consequences of sharing things there, so my messages and content are basic and not highly personal. on whatsapp you had a lot more sharing of personal things (think family chats etc). now the owner of that information has changed and the consequences are still unclear. it’s the mixing of these different spheres and lack of clarity how the terms of services are changing due to it.